Jan 15, 2019, Toronto, Ontario – Ethiopian Airlines Canada’s partnership with SickKids Foundation in Toronto helped support the SickKids Centre for Global Child Health’s (C-GCH) Capacity Building programs in sub-Saharan Africa last year. The 24 round-trip tickets donated by Ethiopian Airlines Canada in late 2017 were divided between the C-GCH and the SickKids International Patient Office, which is supported by The Herbie Fund. The Herbie Fund helps children around the world receive life-saving surgery and treatment at SickKids in Toronto. Using the donated tickets, C-GCH team members flew to Ethiopia, Mali and Ghana to assess, plan and deliver important newborn and child health programs in 2018. In Ethiopia, C-GCH is delivering a specialized newborn care education training module for health workers working with small and sick newborns in remote areas. Through the C-GCH International Program Evaluation Unit, C-GCH is working with regional and national Ministries of Health and NGOs to evaluate ongoing project to strengthen maternal, newborn and child health in Mali’s Koulikoro and Sikasso regions. In Ghana, the SickKids-Ghana Paediatric Nursing Education Partnership (PNEP) aims to contribute to reducing preventable deaths and improving wellbeing of newborns and children in Ghana, and advance both child health and the profession of nursing in Ghana through practice-focused paediatric nursing education. “We are very proud to support SickKids. By providing flights we know it does contribute towards a positive change for many families and healthcare professionals. It’s a partnership we value and know we are supporting a great cause,” said Birhan Abate Ethiopian Airlines Canada Country Manager. 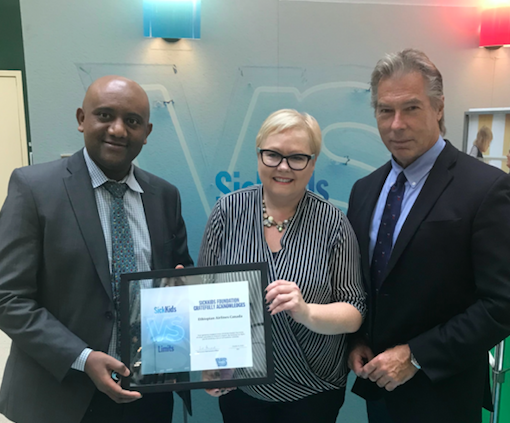 Photo Above: Birhan Abate Ethiopian Airlines Canada Country Manager, Wendy Dempsey Associate Director, Cause Marketing, SickKids Foundation and David Timmins, Ethiopian Airlines Canada National Sales Manager. Ethiopian Airlines (Ethiopian) is the fastest growing Airline in Africa. In its seven decades of operation, Ethiopian has become one of the continent’s leading carriers, unrivalled in efficiency and operational success. Ethiopian operates the youngest and most modern fleet to 93 international destinations across five continents. Ethiopian fleet includes ultra-modern and environmentally friendly aircraft such as Airbus A350, Boeing 787, Boeing 777-300ER, Boeing 777-200LR, Boeing 777-200 Freighter, Bombardier Q-400 double cabin with an average fleet age of five years. In fact, Ethiopian is the first airline in Africa to own and operate these aircraft. The airlines operates five direct flights weekly from Toronto to Addis Ababa with connections 53 destinations Ethiopian is currently implementing a 15-year strategic plan called Vision 2025 that will see it become the leading aviation group in Africa with seven business centers: Ethiopian Domestic and Regional Airline; Ethiopian International Passenger Airline; Ethiopian Cargo; Ethiopian MRO; Ethiopian Aviation Academy; Ethiopian In-flight Catering Services; and Ethiopian Ground Service. Ethiopian is a multi-award-winning airline registering an average growth of 25% in the past seven years.